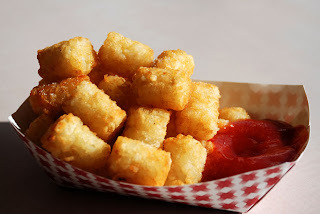 Indian Khana, Made Easy: Tater Tots Revived - Not Just 4 Kids! My last entry about "Hot Summer Treats" featured this snack called Aloo Papdi Chaat that I have tried at many restaurants but I never liked it as much as when I make it at home. 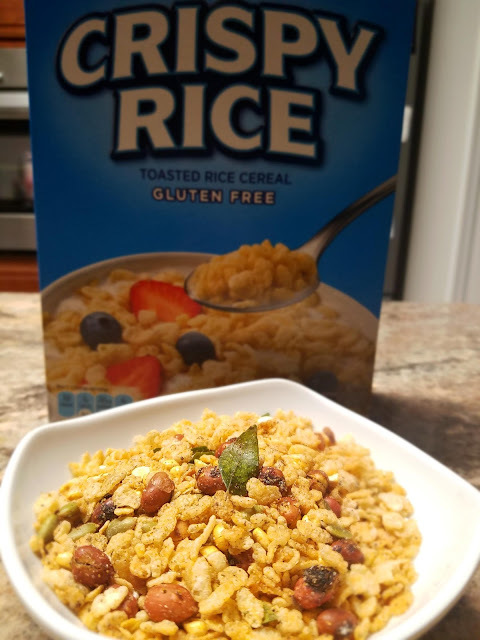 The ingredients are fresher and everything is still crispy when you are eating it. Well today, I've got another treat for you to try. It's called Aloo Tikki Chaat and the main ingredient is none other than TATER TOTS!! You're probably thinking, "is she crazy, those are for kids". Well, I'm not and they are perfect for this "off the street" snack. I say it's off the street because in India, specifically in Delhi and Bombay, there are street vendors that make this hot off the grill and serve it up with different sauces and people go crazy for them. You don't have to go to India to enjoy this snack, I will show you how to make it in the comfort of your home. In the Aloo Papdi Chaat snack, you had to add crispy bits to make it more crunchy. For this recipe, you don't need to add those because you will use baked tater tots which you can make as crunchy as you want. Here are the ingredients from left to right: Chaat Masala, Tamarind Chutney, Coriander Chutney, Yogurt, and Tater tots (or you can use Mini Potato Patties). 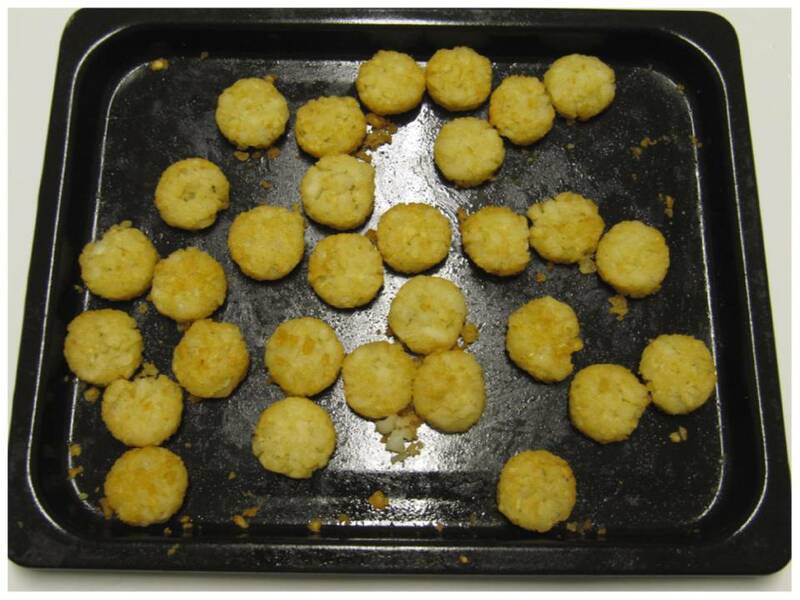 1) Thaw the contents of the tater tots bag and place them in a greased baking sheet. Follow the baking instructions listed on the bag. If you want them to be a bit more crunchy, leave them in longer. 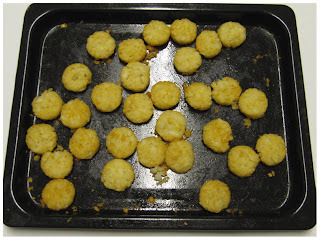 2)﻿ Take 5-6 tater tots or patties off the sheet and mash them up on a plate with a fork. 3) Dilute the chutneys with a little bit of water before adding to the potato mixture. Most of these chutneys are concentrated so they will have a strong taste. Adding water to them will tone the taste down and won't clump up your snack. 4) Next add yogurt to the mixture, and then sprinkle chaat masala and sev on top. The recipe is now completed. I now present this scrumptious snack to you. Go enjoy it. Savor every last tot morsel. ***Quick Tip: Two of the ingredients in this recipe (such as tamarind and coriander chutney) are already found in most Indian households because they are used as condiments for other snacks and dishes. They are like ketchup or mustard sauce for American food. My kids love chaat. but i hate going thru the trouble of making the tikkis. This is a nice, convenient idea. I never thought of doing this with tater tots. Going to try this out soon. I'm glad you liked our idea. Tell us how it turns out.